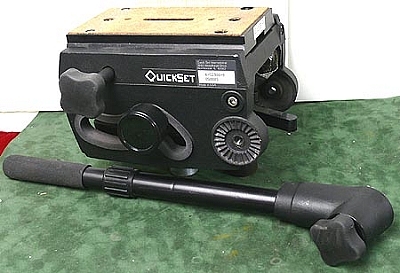 The QuickSet 4-52304-9 QHH-5 Cam Head mounts on QuickSet's Hercules line of tripods and piers. It includes the Camera Plate and a Control Arm (shown in photo). The Camera Plate is a sliding dovetail design that allows you to balance the camera mounted on it easily. A very High-Quality and smooth pan and tilt head, that is priced at over $3000 new...We have a unused example that is tan in color instead of black, first come-first served!